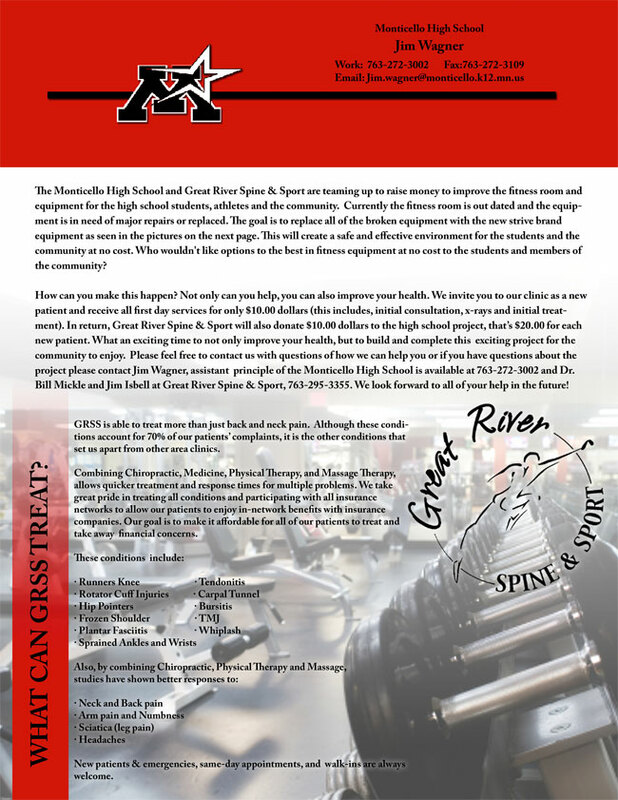 The Monticello High School and Great River Spine & Sport are teaming up to raise money to improve the fitness room and equipment for the high school students, athletes and the community. The condition of the fitness room now is out dated and the equipment is in need of major repairs or needing to be replaced. The goal is to replace all of the broken equipment with the new strive equipment. This will create a safe and effective atmosphere into the future. 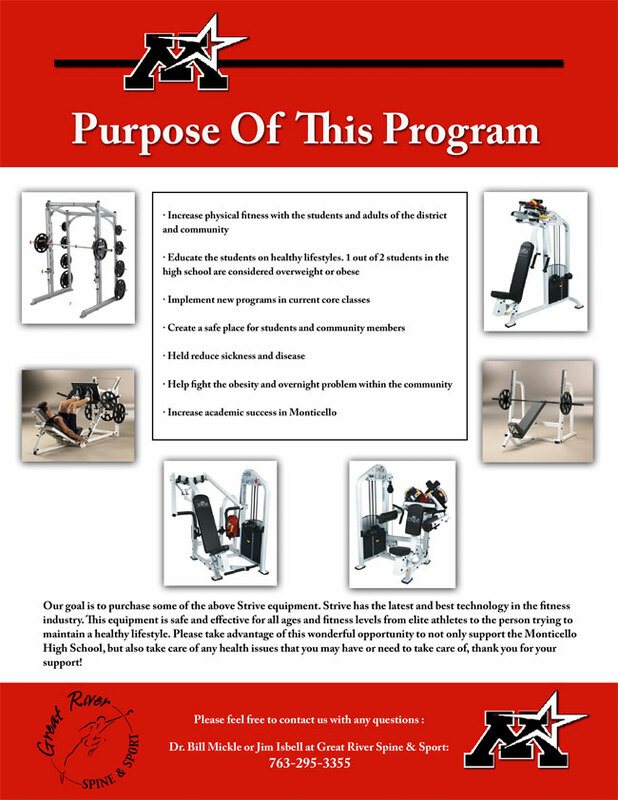 Who wouldn't like options to the best in fitness equipment at no cost to the students and members of the community. How can you make this happen? Not only can you help, you can also improve you health. We invite you to our clinic as a new patient and receive all first day services for on$10.00 dollars (this includes, initial consultation, x-rays and initial treatment). In return, Great River Spine & Sport will also donate $10.00 dollars to the high school project, that's $20.00 for each new patient. What an exciting time to not only improve your health, but to build and complete this exciting project for the community to enjoy. Please feel free to contact us with questions of how we can help you or if you have questions about the project please contact Jim Wagner, assistant principle of the Monticello High School is available at (763) 272-3002. Dr. Bill Mickle and Jim Isbell are available at Great River Spine & Sport, (763) 295-3355. In the next few months we will be hosting many community events which will be posted on the website. If you or your business would like to be involved to help, please don't hesitate to ask. Below is the flyer that you will see circulated throughout the community. We look forward to all of your help in the future!